Democratic National Committee officials and a group of state party leaders were unable Tuesday to resolve their bitter fight over how the party manages and pays for the voter data used in campaigns. The saga, which spilled into open view in recent weeks, pits the DNC and its push for a more centralized voter data system against many state party leaders wary of giving up control they now enjoy. The eventual outcome will determine how extensive and useful a voter information file will be to the Democratic presidential nominee in 2020. 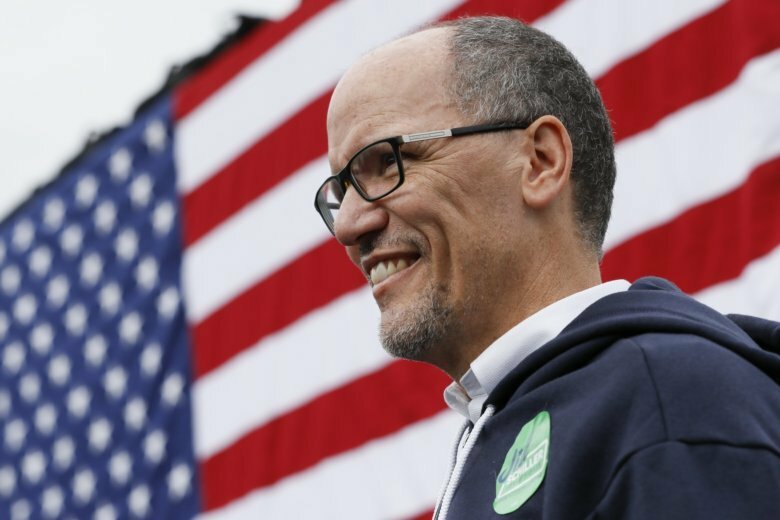 The fight also is testing DNC Chairman Tom Perez and his promises to rebuild trust across Democrats’ national headquarters, state parties and donors across the country following a 2016 campaign that left the party fractured. DNC aides did not make Cahill available for questions. Efforts to reach Martin after the meeting concluded were unsuccessful. The gathering followed a recent round of emails among Perez and state party chiefs, including Martin, with each side effectively accusing the other of a counterproductive power grab. Perez supports creation of a data trust — a legal entity separate from the party itself — designed for the national party, state party, Democratic candidates and the left’s special interest groups to share data in real time. Republicans already use a similar structure, and Democrats concede it was an underappreciated variable in President Donald Trump’s 2016 victory. State party leaders say they also want sharable, real-time data. But they argue that could be accomplished through a co-operative managed through state parties and aided by a third-party vendor, TargetSmart, a company many state parties already use as a data contractor. A key in both proposals is having some independent entity that could collect data from independent groups — Planned Parenthood, Sierra Club or Indivisible, for example — without running afoul of campaign finance rules that prohibit coordination between those groups and political parties or individual campaigns. In the DNC’s preferred model, the trust itself is the go-between. In a counterproposal advanced by Martin, TargetSmart could end up being at the center. A key point of contention is who would control the data. Now, state parties control their own voter files, feeding it to a national voter file that the DNC pays to have analyzed and put into a form that is usable for individual campaigns. But by owning their own data, state parties get to make money selling it to candidates. South Carolina Chairman Trav Robertson recalls serving as Oklahoma’s state party executive director in lean times. “If I didn’t have that revenue, I’d have had to shut it all down,” he said. National party officials insist that the trust model would ensure a source of revenue for state parties, while maintaining state control over how the data is used. That includes, for example, whether primary challengers of an incumbent Democrat could buy a state’s voter file. But the details haven’t been ironed out. There’s also concern from Robertson and other state chairs about who would control the trust. A co-op model would be run by the executives of the organizations involved, such as state chairs or DNC executives. The governing board of a trust would be determined by the entity’s legal structure. Both sides have raised questions about financial motives, but there would be for-profit entities involved either way — just as there are in the current data operation. The trust itself legally would be a for-profit enterprise, though Perez’s team notes it would not have shareholders collecting dividends and would steer money back into party data building. Under the state plan, TargetSmart would certainly profit as the principal contractor, as it does now in its work with state parties.